A perfect transposon storm? Many retrotransposable elements are reactivated in a Drosophila model of TDP-43 ALS. Subsequent analysis indicated that the siRNA machinery may be impaired through a TDP-43 mechanism (Krug et al., 2017, CC BY 4.0 license). More than 98% of the human genome remains untranslated. Nearly half of these sequences are instead retrotransposable elements, mobile sequences that can ‘jump’ around the genome, leaving mutations and indels in their wake. To keep these retrotransposable elements from creating havoc, gene silencing systems evolved to protect the human genome by suppressing their activation. But according to a growing number of studies, these systems can break down during the aging process causing many of these retrotransponsable elements to mobilize which may contribute to neurodegenerative disease (Maxwell et al., 2011; DeCecco et al., 2013; Muotri et al., 2010; Kaneko et al., 2011; Tan et al, 2012; Li et al., 2013). Now, researchers at Stonybrook University School of Medicine in New York report that.the reactivation of at least one retrotransposable element contributes to a Drosophila model of TDP-43 ALS. 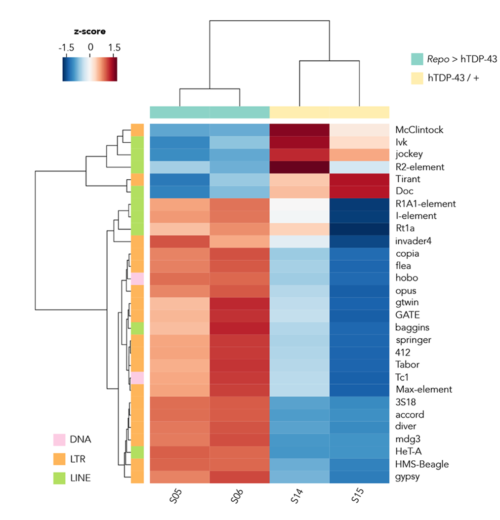 The study, led by Joshua Dubnau, found that expression of human TDP-43 in neurons or glia, weakens the siRNA-based gene silencing machinery, leading to the expression of some retrotransposable elements. Silencing one of these elements in glia, the endogeneous retrovirus (ERV) gypsy, partially reduced the loss of cells in the brain about 25% suggesting its reactivation may contribute to neurotoxicity. Subsequent analysis indicated that gypsy may mediate this toxicity through a DNA damage-based mechanism. Together, the results suggest that the siRNA silencing machinery may be impaired in ALS through a TDP-43-mediated mechanism. This may lead to the reactivation of some retrotransposable elements, which may result in DNA damage, contributing to neurotoxicity in the disease. The study comes at the heels of results from Avindra Nath of the National Institute of Neurological Disorders and Stroke (NINDS) in Maryland which detected the expression of human ERV HERV-K in motor neurons of some patients with sporadic ALS (see October 2015 news; Douville et al., 2011;Li et al., 2015). The study is published on March 16 in PLOS Genetics. In 2015, Avindra Nath’s team reported that HERV-K may become reactivated in some people with ALS (Li et al., 2015). These retroviral sequences, known as HERVs, are thought to have integrated into the genome millions of years ago due to infection and for the most part lost their ability to mobilize due to mutation (Lander et al., 2001). The study found in part, that HERV-K could be detected in the brain and the anterior horn of the spinal cord in some patients with sporadic ALS – some of the same regions affected by the disease. Subsequent analysis indicated that the expression of one of its viral proteins, HERV-K ENV, which encodes its envelope, resulted in motor dysfunction in mice. The results suggest that the reactivation of this retrovirus may contribute to the motor neuron pathology in the disease. The findings build on previous observations from multiple research investigators that circulating levels of reverse transcriptase in the blood are increased in some patients with ALS and their relatives, suggesting retroviruses buried in the genome might contribute to the disease (Steele et al., 2005; MacGowan et al., 2007; McCormick et al., 2008). Now, researchers at GeNeuro in Switzerland are developing antibodies to neutralize the virus. The potential therapeutic strategy, which targets the envelope protein of HERV-K, is currently at the preclinical stage. The project is in collaboration with Nath’s team at NINDS. Stay tuned. Krug L, Chatterjee N, Borges-Monroy R, Hearn S, Liao WW, Morrill K, Prazak L, Rozhkov N, Theodorou D, Hammell M, Dubnau J. Retrotransposon activation contributes to neurodegeneration in a Drosophila TDP-43 model of ALS. PLoS Genet. 2017 Mar 16;13(3):e1006635. [PubMed]. Li W, Lee MH, Henderson L, Tyagi R, Bachani M, Steiner J, et al. 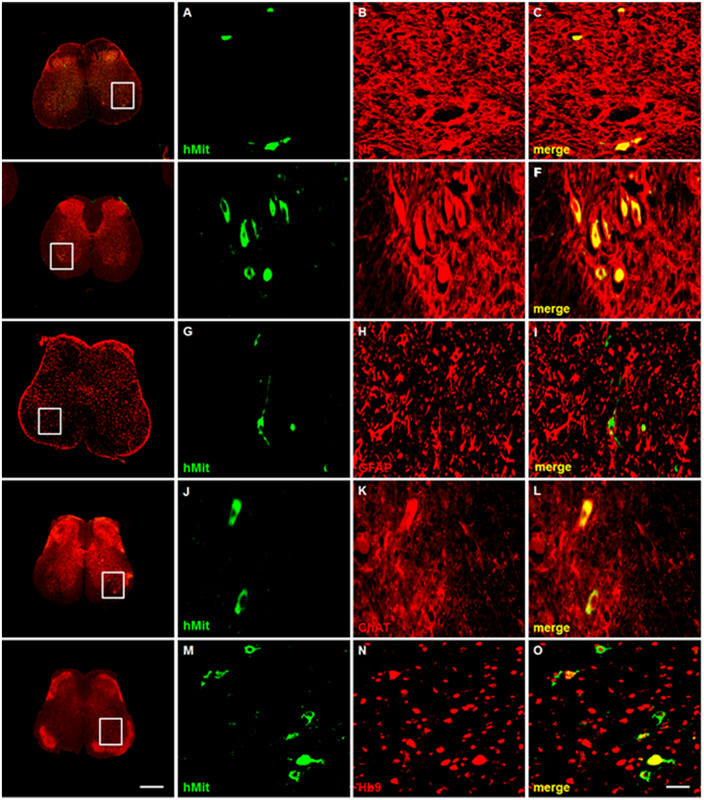 Human endogenous retrovirus-K contributes to motor neuron disease. Sci Transl Med. 2015; 7(307):307ra153. [PubMed]. Douville R, Liu J, Rothstein J, Nath A. Identification of active loci of a human endogenous retrovirus in neurons of patients with amyotrophic lateral sclerosis. Ann Neurol 69(1):141-51. [PubMed]. Maxwell PH, Burhans WC, Curcio MJ. Retrotransposition is associated with genome instability during chronological aging. Proceedings of the National Academy of Sciences of the United States of America. 2011; 108(51):20376-81. [PubMed]. De Cecco M, Criscione SW, Peterson AL, Neretti N, Sedivy JM, Kreiling JA. Transposable elements become active and mobile in the genomes of aging mammalian somatic tissues. Aging. 2013; 5(12):867-83. [PubMed]. Muotri AR, Marchetto MC, Coufal NG, Oefner R, Yeo G, Nakashima K, et al. L1 retrotransposition in neurons is modulated by MeCP2. Nature. 2010; 468(7322):443-6. [PubMed]. Tan H, Qurashi A, Poidevin M, Nelson DL, Li H, Jin P. Retrotransposon activation contributes to fragile X premutation rCGG-mediated neurodegeneration. Human molecular genetics. 2012; 21(1):57-65. [PubMed]. Li W, Prazak L, Chatterjee N, Grüninger S, Krug L, Theodorou D, Dubnau J. Activation of transposable elements during aging and neuronal decline in Drosophila. Nat Neurosci. 2013 May;16(5):529-31. [PubMed]. Kaneko H, Dridi S, Tarallo V, Gelfand BD, Fowler BJ, Cho WG, et al. DICER1 deficit induces Alu RNA toxicity in age-related macular degeneration. Nature. 2011; 471(7338):325-30. [PubMed]. Steele AJ, Al-Chalabi A, Ferrante K, Cudkowicz ME, Brown RH Jr., Garson JA. Detection of serum reverse transcriptase activity in patients with ALS and unaffected blood relatives. Neurology. 2005; 64(3):454-8. [PubMed]. MacGowan DJ, Scelsa SN, Imperato TE, Liu KN, Baron P, Polsky B. A controlled study of reverse transcriptase in serum and CSF of HIV-negative patients with ALS. Neurology. 2007; 68(22):1944-6. [PubMed]. McCormick AL, Brown RH Jr., Cudkowicz ME, Al-Chalabi A, Garson JA. Quantification of reverse transcriptase in ALS and elimination of a novel retroviral candidate. Neurology. 2008; 70(4):278-83. [PubMed]. Image on home page: Retrotransposition, Marius Walter. CC BY SA 4.0.